Home =Technical Share= How Sway Bars/Anti-Roll Bars Work? How Sway Bars/Anti-Roll Bars Work? Here's how a sway bar works. Normally, without a sway bar when the car corners the weight of the chassis shifts toward the outside of the turn compressing the springs on that side. The springs on the inside generally extend a little, or do nothing. Relatively to the chassis itself, it appears that the outside suspension compresses and the inside doesn't. A sway bar couples the suspensions on each side to each other, *AND* relative to the chassis. If you could put the car up on a lift and actually compressthe suspension on one side by hand, then a sway bar makes the compression of one side also try to compress the suspension on the other. Ok.. it's still not really obvious why that's useful so I'll say the same thing a different way. A sway bar effectively increases the spring rate on whichever side is compressed the MOST. If the sway bar were absolutely solid with no twist so there's a 100% coupling between each side then an attempt to compress one spring actually becomes an attempt to compress both springs. It doubles the spring rate. If the bar has some twist, then it may only increase the spring rate by say 50% on whichever side is compressed the most. So you're driving down the road and you go over a bump that goes across the entire lane. The sway bar does nothing. Both sides compress normally. You go around a corner and the chassis starts to lean and compress the outside suspension and now it's as though you have a bigger spring out there, so the car remains more level. That's the good part. Here's the bad part. You hit a bump with only one side, and it behaves the same way, as though you have a stiffer spring, so you feel uneven bumps more. You feel it crossing anything diagonally as well, such as coming into or out of a parking lot or driveway curb. That's all the simple "How does a sway bar work?" part. The real tricky one is.. "What does a sway bar do?" 1. We know it keeps the car more level. So what? Limiting the lean of the body is good because it means that when you take a quick set into a turn, that the body isn't still moving sideways after the tires at their limits. Otherwise you turn in quickly, the tires grip, then the body finally finishes leaning, when it stops, the tires loose grip. 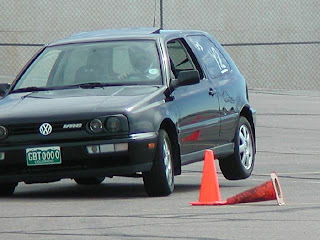 This is especially noticeable in most cars in the slalom where you lean one way then the other and so forth. just just nasty. A big sway bar will prevent the body roll in the first place, and prevent the suspension compression on the outside which causes the positive camber change relative to the chassis. 3. Transfer lateral grip from one end of the car to the other. This one is a real trick to understand, but racers exploit this EVERY time they go on the track. Their spring rates are often so high, the cars so low, and their suspension travel so little, that the whole camber and body lean problem is already a non-issue. The car doesn't lean much with 500 lb springs. They use their bars to change the balance of the car. Here's the simple rules first. A big bar on the front, increases rear lateral and motive traction. A big bar on the rear, increases front lateral and motive traction.The applications. If the car is understeering, decrease front bar size, or increase rear bar size. This increases front lateral grip and decreases rear lateral grip giving the car a more neutral to oversteer feel. Reverse the process for too much oversteer. I mentioned motive grip. That's the neat one. Let's say your RWD car is handling ok, but everytime you get into a corner hard and get on the gas the rear inside tire breaks looseand spins. You can't accelerate out of the turn. You can go around the turn quite quickly, but you can't accelerate out, and the guy with traction hooks up and passes you halfway down the next straight because he came out of the turn going 3-4mph faster. The reason you're losing the traction at the inside rear, is usually because the rear bar is too big. As the rear outside suspension compresses, it's actually causing the rear inside suspension to compress as well (because the bar couples the sides.. remember where we started), and that decreases the weight on the rear inside tire. First thing. Decrease size of rear bar. That decouples the sides a bit, let's the inside tire press down on the road more and thus not spin when you're on the gas. Here's where it gets really tricky. If decreasing the size of the rear bar doesn't help enough the next thing you do is increase the size of the front bar. When the outside front compresses in a corner, it causes the inside front to compress and may actually lift that tire completely off the ground. The car is now sitting on 3 tires and guess where the weight that was on the inside front goes? Outside front? Some of it. The rest goes to the inside rear where we need more grip. The total weight of the car hasn't changed. It's just been redistributed, and a sway bar at one end, actually transfered weight to the other end of the car. Here it is in action on a RWD car. See the inside front tire off the ground. That translates into more motive grip at the rear, and thus more acceleration, and believe me, that car rockets out of corners. All of this trickery applies to a FWD car too, and since the front tires share all of the motive AND most of lateral traction (because most of the weight is in front), all the things that happen with big bars at either end are even more extreme. A big front bar stabilizes the body lean more but also creates a lot more understeer, and may make the inside front tire spin madly under power in a corner. A big rear bar can't give you back much lateral grip up front, but it can give you back some motive traction. Basically lettting you accelerate out of the turn, even when the front end is sliding pretty badly. Here's a big rear bar in action on a FWD car. So that's it. How they work, and what they do.